Mustang GT350 began its journey in 1964 with lighter and powerful models in comparison to original Mustang. With coming years company kept on enhancing the glory by upgrading engineering and looks and thus came the 2015, when company released its 2016 model year, Ford Mustang Shelby GT350 2016. With this Ford brings its all new naturally aspirated powerful engine producing over 500hp and over 400 lb ft torque. 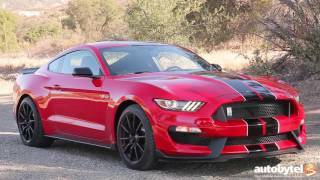 Well these aren’t all features that make Shelby GT350 2016 distinct, keep reading to know more. The interior of Ford Mustang Shelby GT350 2016 splatters sporting details all across the cabin with its perfectly designed and bolstered track based seats and flat bottom steering wheel. The entire gleam that could distract the driver has been either removed or reduced for safe driving without much interruption to mental presence over hard-core sporty rides. 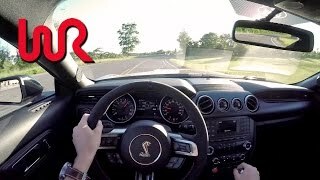 Ford Mustang Shelby GT350 comes with five driving modes and carries all those new features that come with today’s any new generation performance car. 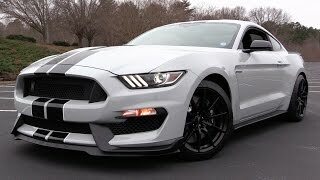 Features like AMS brakes, stability and traction control systems and the extra tuning done with the exhaust systems make the Ford Mustang Shelby GT350 a way ahead in its class. For those who are little disappointed with the lessening of gleam, you may go for tech package though not entirely look oriented but additional features like, MyFord Touch LCD Infotainment system, Dual zone climate control, Shaker audio stereo and leather seats with power adjustments might prove to be an additional treat for you. 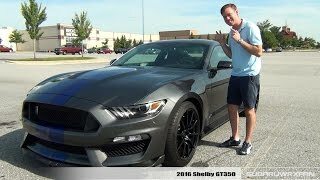 The exterior of Ford Mustang Shelby GT350 2016 portrays the most aggressive look till date by any Mustang. Let’s begin with front fascia model gets new splitter while the air intakes or let’s say anything that has the ability to drag some air inside gets broader in size. Perfect example to this can be seen upon a close notice of grille, it gets angled ducts to meet the same need. Fog lights have been replaced by space for fresh air so as to cool the brakes. Not just these for Shelby GT350 2016 even the hood gets a huge vent. In all let that be the 19” lightweight alloy wheels or any other upgrade, each and everything has been done keeping in mind increased airflow and aerodynamic efficiency. Ford Mustang Shelby GT350 2016 replaces the predecessor 5.0 liter Coyote V8 and brings under its hood, the first ever Ford production engine using a flat-plane crank 5.2 Liter V8 engine. Not only these the engine is also the first ever Ford created naturally aspirated engine producing over 500 horsepower and over 597 nm torque. The engine will be paired to six-speed manual transmission. However no performance specs have been shared but still speculations echo over 175 mph of top speed.